Curved OLED Archives - Touch Display Research, Inc.
That statement is wrong. Both LG and Samsung showed several curved display at CES 2014, but the 105-inch curved displays are LCDs, not OLED. The largest curved OLED demonstrated is 77-inch so far (not count the type that tile many OLED displays together). It’s a bit of heartbreak to see that this famous consumer electronic publisher spread the wrong information. As I wrote in our mission: I’m concerned about these people and the people they advise. I feel as a Ph.D. and experienced technology analyst, I have the responsibility to provide to my clients correct knowledge, up-to-date information, forward-thinking analysis, and best business strategies. Touch Display Research has published CES 2014 analysis report in January, it provided detail analysis of all the curved LCDs and curved AMOLED. This entry was posted in Flexible curved display, OLED, TV and tagged 105 inch, curved display, curved LCD, Curved OLED, Large display, LCD, LG, Samsung on March 31, 2014 by jennycolegrove. At Mobile World Congress (MWC) 2014, Samsung announced its newest wearable device: Gear Fit. It has a 1.84” super AMOLED display, with 432X128 pixel format. (Please note, some website said it is 1.4”, which is wrong). Samsung claims the Gear Fit is “the industry’s first curved, super AMOLED wearable device”. I think that is correct. Although there are a dozen smart watches entered the market recently, but most of them are using flat, rigid display. As Touch Display Research reported 4 months ago, we believe flexible and curved displays are more ergonomic for the wrist, and larger-sized flexible displays could fit better and show more information. The Gear Fit is what a smart watch should look like. We forecast 2 inch or larger curved display will be adopted in smart watch as well. 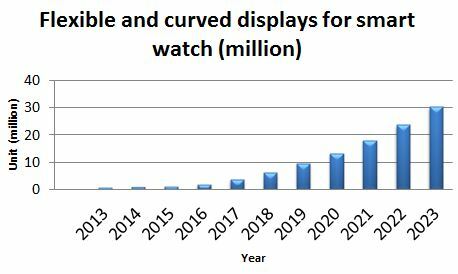 In the “Flexible and curved display technologies and market forecast” report, Touch Display Research forecasts 30 million units flexible and curved displays will be shipped for smart watch application by 2023. This entry was posted in Conference Review, Displays, Flexible curved display, OLED and tagged AMOLED, curved display, Curved OLED, flexible display, flexible watch, Mobile World Congress, MWC 2014, Samsung, wearable devices on February 25, 2014 by jennycolegrove. I just came back from the 2014 FLEX conference and the SID LA Symposium. There are many highlights in these 2 conferences. One of the exciting news is about the Organic TFT (OTFT) backplane AMOLED. On Feb 6th, 2014, Plastic Logic’s director of research and partnerships, Mr. Mike Banach gave a presentation titled “A New Frontier for Flexible Displays”. At the same day, both Plastic Logic and Novaled announced their partnership and their demo of OTFT backplane AMOLED. Touch Display Research analyst agrees with that. Touch Display Research forecasts 30 million units flexible and curved displays will be shipped for smart watch application by 2023. Overall flexible and curved display market will reach $27 Billion by 2023. Source: Touch Display Research. “Flexible and Curved Display and Lighting Technologies and Market Forecast” report. September, 2013. It is said Merck’s organic semiconductor material was used in the OTFT prototype. As we covered in our “Flexible and Curved Display and Lighting Technologies and Market Forecast” report, Sony has demonstrated OTFT backplane AMOLED before. This entry was posted in Company News, Conference Review, Flexible curved display, OLED, travel and tagged AMOLED, curved display, Curved OLED, flex conference, flexible display, flexible electronics, Flextech, Merck, Novaled, OLED, Organic TFT, OTFT, Plastic Logic on February 10, 2014 by jennycolegrove. I’ve been at CES 2014 for 3 days by now. One big trend this year is: curved TV. 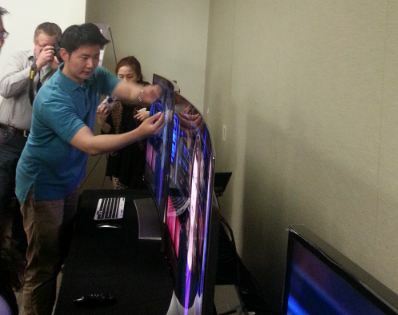 As we reported 2 days ago, Samsung showcased their curved TV and bendable TV at Monday’s press conference. LG’s booth is also full of curved TVs. The most attractive one is the 77” 4K flexible OLED TV, which they claim is the world’s first 77” flexible 4K OLED TV. I think that is true. Many other TV suppliers also showcased curved TV at this CES, such as Hisense, Haier, Konka, Panasonic. Curved TVs provide a unique form factor and cinema-like immersive view. We believe the ecosystem of flexible and curved displays is maturing. Good progress has been made in many areas. TFT on plastic substrate is already commercialized; ultra-thin glass is commercially available; ITO-replacement material is in mass production; bond de-bond and roll-to-roll manufacturing processes and equipment used for flexible displays are more precise. In our recently published Flexible and curved display and lighting report, Touch Display Research forecasts that the flexible and curved display market will reach $27 Billion by 2023. More analysis can be found in our Touch and Emerging Display monthly report. This entry was posted in 4K, Company News, Conference Review, Displays, Flexible curved display, Flexible Lighting, OLED, TV and tagged 4K, 4K curved, curved display, Curved OLED, flexible display, Haier, Hisense, Konka, LG, market forecast, Panasonic, Samsung, TV on January 8, 2014 by jennycolegrove. Samsung’s curved OLED display mobile phone is finally official. The name is Galaxy Round, which will be available in South Korea market from October 10th for $1013. Source: Samsung and Touch Display Research Inc.
Touch Display Research believes that the curved OLED display Samsung used on Galaxy Round mobile phone might be glass substrate, not plastic. Samsung has registered the trade mark “YOUM” for its plastic AMOLED. But Samsung didn’t mention “YOUM” in its announcement, and didn’t mention “unbreakable” either. Thus we believe the Galaxy Round is using glass substrate. Touch Display Research believes the eco-system for flexible and curved displays is maturing. We forecast that the flexible and curved display market will reach $27 Billion by 2023, which is about 16% market share of the global display revenue in 2023. More analysis of curved display and curved touch panel can be found in our newly published Flexible and Curved Display Technologies and Market Forecast 2013 report. This entry was posted in Displays and tagged AMOLED, curved display, Curved OLED, Curved phone, flexible display, Galaxy Round, Samsung, Substrate, touch display research on October 9, 2013 by jennycolegrove.